After paying for tuition, books and accommodation throughout college, the word “free” sounds like sweet music to the ears of any student. The FreeBike Project not only allow students on campuses across America to lease bicycles at no cost for a semester, but they also donate a bike to students in the developing world for every set of wheels borrowed in the U.S. 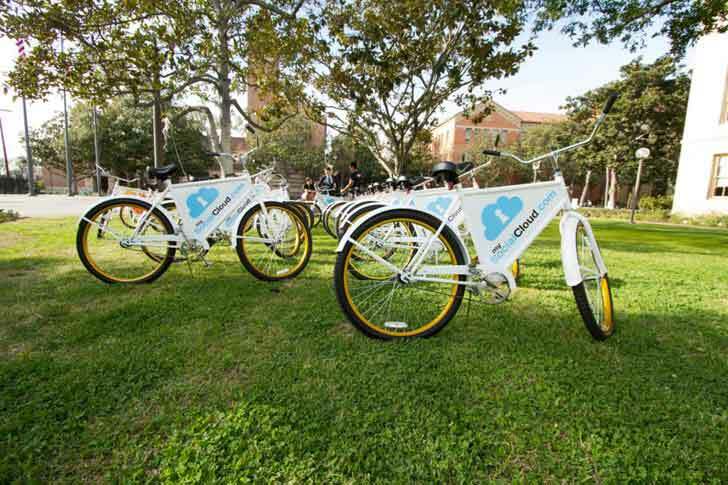 The FreeBike Project was launched by Danish students Johan Bender and Kim Sanderhoff while they were studying at USC in 2012. The enterprise was meant to be an exploration in entrepreneurship as well as an effort to increase the appeal of cycling. “Kim and I strongly felt that our concept had the potential to create positive change in the world. The idea was to promote green, healthy and free means of transportation for college students, while providing a better youth-marketing alternative for brands and businesses,” Bender told Forbes. The program is funded by renting ad space that hangs from the top tube in between the handlebars and seat. Companies such as AEG, the North Face, and My Social Cloud have already signed on. Students are required to post a social media photo of their rides once a month so as to enhance the Project’s outreach and encourage advertisers to purchase the rolling real estate. For every bicycle rented by a student in the United States, another is donated to someone in a developing country through a partnership with Bikes for the World. By taking advantage of this free service, American academics can provide vital transportation to those seeking an education in areas that are difficult to access. 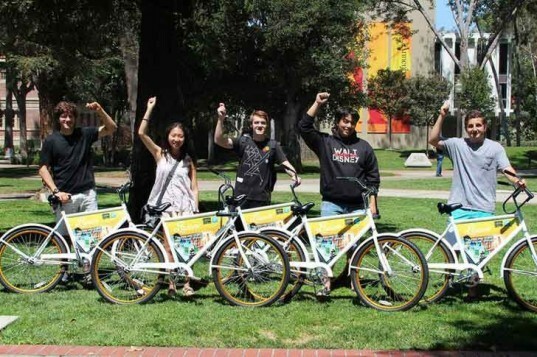 The FreeBike Project is already present on campuses in San Francisco, Los Angeles, Seattle, Boston, and D.C. The team is seeking investors to further expand their reach, and the group hopes to lease 10,000 bikes across the nation by 2016. As the popularity of bike share programs grow, the FreeBike Project will serve as an excellent model for businesses with a social conscience. After paying for tuition, books and accommodation throughout college, the word "free" sounds like sweet music to the ears of any student. The FreeBike Project not only allow students on campuses across America to lease bicycles at no cost for a semester, but they also donate a bike to students in the developing world for every set of wheels borrowed in the U.S.